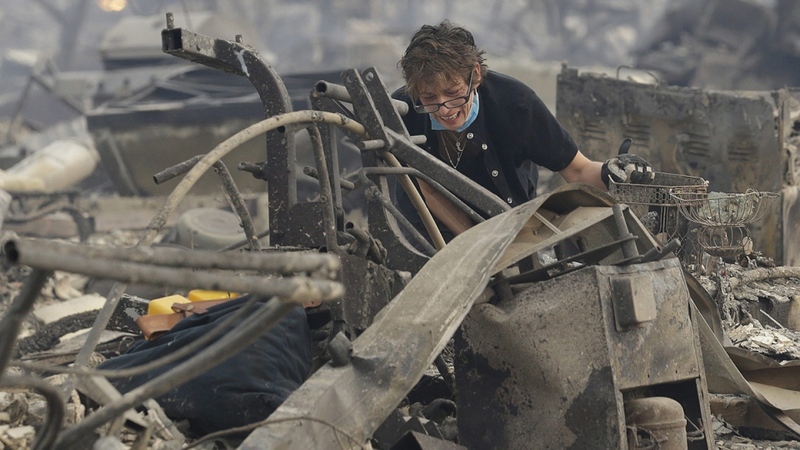 SONOMA, Calif. -- Fueled by the return of strong winds, the wildfires tearing through California wine country exploded in size and number Wednesday as authorities ordered new evacuations and the death toll climbed to 21 -- a figure expected to rise higher still. Three days after the fires began, firefighters were still unable to gain control of the blazes that had turned entire Northern California neighbourhoods to ash and destroyed at least 3,500 homes and businesses. The entire historic town of Calistoga, population 5,000, was evacuated. 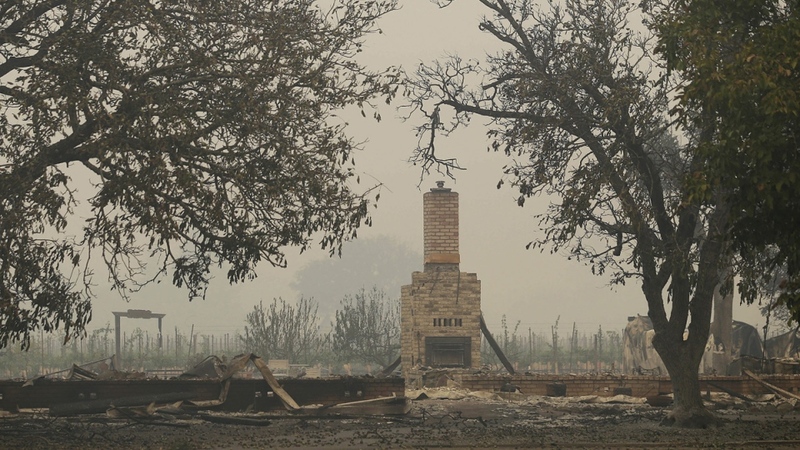 In neighbouring Sonoma County, authorities issued an evacuation advisory for part of the town of Sonoma and the community of Boyes Hot Springs. By that time, lines of cars were already fleeing. The fires have burned through a staggering 265 square miles (686 square kilometres) of urban and rural areas. High winds and low humidity made conditions ideal for fire to ignite virtually anywhere on ground or brush that was parched from years of drought. Flames have raced across the wine-growing region and the scenic coastal area of Mendocino farther north, leaving little more than smouldering ashes and eye-stinging smoke in their wake. Whole neighbourhoods were levelled, leaving only brick chimneys and charred appliances to mark sites that were once family homes. Increasingly large pieces of grey ash drifted down on the community. Sirens wailed. Residents who had held out hope of staying at home, packed up to leave. 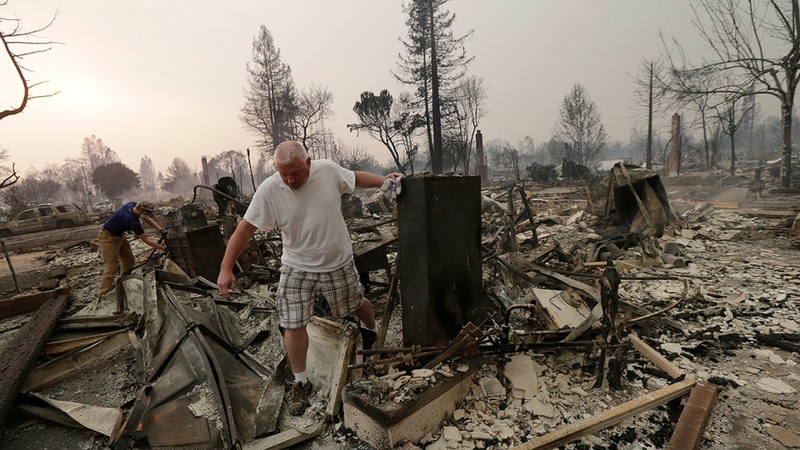 Alejandro Rodriguez had been evacuated from one tiny Sonoma Valley town, only to have deputies come to the neighbourhood he had relocated to and tell residents there to pack up to go. In Southern California, cooler weather and moist ocean air helped firefighters gain ground against a wildfire that has scorched more than a dozen square miles. Orange County Fire Authority Capt. Steve Concialdi said the blaze was nearly halfway surrounded and full containment was expected by Saturday, but another round of gusty winds and low humidity levels could arrive late Thursday. Gecker reported from San Francisco. Associated Press writers Olga R. Rodriguez, Juliet Williams and Andrew Dalton in San Francisco contributed to this report.